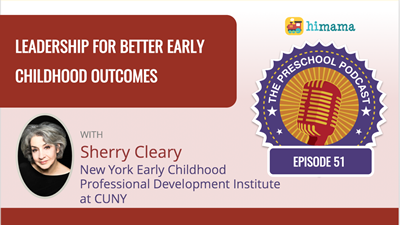 Join us for an evening with leaders from the Brooklyn Kindergarten Society, NYC Department of Education, NYC Department of Health and Mental Hygiene, and NY Early Childhood Professional Development Institute. Each leader will discuss the transition from the private, not-for-profit sector to working for public agencies or vice versa. Join us for a light dinner, great speakers, and networking! The excellence of early childhood programs is reliant on the quality and caliber of the leader. The program leader sets the mission, vision, philosophy, and culture of a program. And yet, too many leaders come to the work with limited knowledge and expertise in early childhood management and leadership. 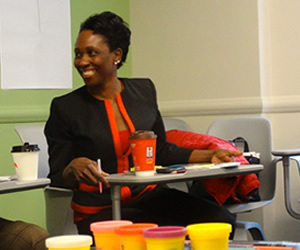 The New York Early Childhood Professional Development Institute, in partnership with the NYC Department of Education lead the Leadership Initiative, designed to support the professional development and success of current leaders and prospective leaders in the early childhood field. 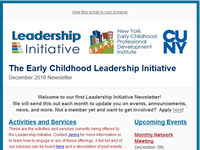 The Leadership Initiative and this website provides early childhood leaders, as well as those who aspire to leadership roles in the future, with resources and opportunities to engage with their peers around the city and support professional development promoting access to excellence for all young children. Early childhood leaders, as well as those who aspire to leadership roles in the future, are welcome to participate in the Leadership Initiative in a variety of ways. Sign up below to start to receiving our periodic newsletter and event announcements! Aspire Registry ID: What is this? The Aspire Registry is New York's Registry for eachly childhood professionals. The registry allows you to build an educational and professional profile, and connects professionals to their licensed child care programs. Program leaders in New York City are required by the Department of Health (DOHMH) to track the qualifications of their staff in the Aspire Registry. An Aspire Registry ID is also required for participation in some activities of the Leadership Initiative and leaders are strongly encouraged to create an Aspire Registry profile. Our monthly newletter offers a round-up of the latest Leadership Initiative events, the books we're reading, member spotlights and more! If you signed up above, you'll already be getting our next issue! The Children’s Program Administrator Credential (CPAC) is a state-recognized credential that addresses the components essential for running early childhood and school-age programs. Both new and experienced administrators may choose to obtain the credential, as well as current teachers who aspire to administrative positions. Those individuals without program management experience will need to complete an internship to obtain the credential. Learn more about the CPAC on our Career Development Services page.